President Larry Roberts called the meeting to order at 6:41 p.m. Directors present for the meeting were Doug Alred, Jane Alred, Christy Astorga, Bonnie Brooks, Errol Daniels, Susan Haag, Angela Harris, Dennis Harrison, Stan Lambert, Franz Lerch, Todd O’Donnell, Ty Payne, Larry Roberts, Larry Sassa, Paul Smith, Lamar Strother, Douglas Tillett, and Jim Van Cleave. Director Stuart Toomey was absent. Approval of 6/5/18 (June meeting) minutes: On a motion by Lamar Strother and seconded by Stan Lambert, the June board meeting minutes were approved as submitted. Treasurer’s Report: Bonnie Brooks distributed copies of the Balance Sheet and the Profit and Loss Detail Statement through August of 2018 with detailed June and July numbers since they had not been previously discussed. Within the financial package was the budget, which was to be discussed during the Finance Committee report. Christy Astorga for Board of Directors – On a recommendation by the Executive Committee, Errol Daniels proposed to elect Christy Astorga to an open position on the board of directors, which was seconded by Bonnie then passed by the board. Christy accepted and was welcomed onto the board. JU Running Lab Renewal – Based on the Finance Committee meeting, Bonnie presented a motion to fund Ryan Sloan, the JU graduate assistant working in the JU Running Lab, for one year which equaled $14,130 (2 payments of $7,065 – fall & spring semesters) in tuition. The motion was seconded by Doug Tillett and passed by the board. Susan Haag voiced to abstain from voting as she was not for or against the motion, but wanted more details regarding the renewal of our involvement with the JU Running Lab. Master Trails Plan – Larry Roberts reported that the July 24th public meeting that was held at FSCJ Technology Center regarding the plan’s progress was well attended by the community and we had several board members attend. The planning committee is currently working on having a demonstration portion completed as an example for the 19.2 miles of trails. There will be an upcoming Times Union article regarding the ongoing project. Summer Camp Scholarships – It was reported that we had received various thank you notes for the camp scholarships from some of the recipients as well as camp videos, which the video has been posted to our Facebook page. The thank you notes show how important and impactful the scholarship program is to our younger running community. Again, this year we were able to award 69 kids with scholarships for a total of $25,875. Sunbeam Proposal – Based on the previous proposal presented from Stratagem regarding the Sunbeam Landfill Trail Project, Larry and Doug meet with the planners and have decided we are no longer pursuing this project. This decision was in conjunction with the Executive Committee’s support as the proposed project would require such a large initial investment along with ongoing financial requirements and other concerns. Tent Status – It was discussed that having the 10 x 10 size is easier to handle, store, and more cost efficient. On a motion presented by Doug and seconded by Dennis, the purchase of another 10 x 10 tent was passed by the board. Cross Country Trail Markers in city parks – It was discussed to maybe develop standard mile markers to be used in the city parks. An example would be the Durbin Creek trails. Perhaps the Race Committee could work together with Colin from the City and Parks department. Where to Run in Jacksonville on JTCRunning.com – Larry presented the idea of developing a tool or database of where to run in Jacksonville. 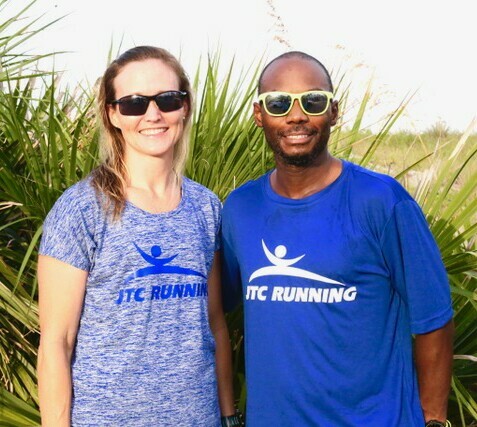 Like our newsletter where it includes information of group runs, but a more in-depth list of information including groups, routes, and races in Jacksonville. From the discussion an ad hoc committee was formed to gather information and work on this. Fall Half Marathon Training Class Kickoff – Our fall half marathon training class kickoff will be Wednesday, September 5th, at the 1st Place Sports San Marco store. Again, we would like to have some board members attend. Registration is currently open, and we have 25 signups currently. We have a video on Facebook regarding how beneficial and enjoyable the class is. We have several returning participants, but we also need to strive to get new runners to attend. Tijuana Flats Summer Beach Run and Kickoff (8/25/18 and 8/6/2018) – Registration is open for Summer Beach Run and we have 600 entries, however due to a scheduling conflict the date has been changed to August 25th and will have an earlier start time of 5pm. Due to the change, 20-25 entries had to be refunded. The new date is the same as a Jaguars preseason game. The SBR kickoff at the Lakewood Tijuana Flats was well attended last night. Guana Trail Races (Sun 12/2/18) – Bob Fernee has retired as race director and our new race director will be Franz Lerch. Registration is currently open on the website. Last Gasp (TBD) – Herb Taskett will serve as the race director. We need to contact JU regarding the race and race date for Saturday, December 29th. Race Committee / Track Meet Committee – Will work on the cross-country mile markers. Classes & Clinics – Jane reported that she is currently in the process of planning some nutritional seminars and sessions with Kelsey Beckman, who is a registered dietitian and avid runner. Community & Public Relations – It was brought up by Doug Alred that we need to be more proactive with Gate River Run and perhaps take on a bigger role. Based on the city development meetings he has attended, by 2020 the Gate River Run will have to have a new route in addition to the unknown status of Lot J and the fairgrounds. We need to position ourselves and our races in a favorable light with the city as we continue to move forward. An idea was suggested that we offer VIP access to city council members for Gate River Run to highlight the importance of the event to our city and the impact it has on our community. Finance – Finance Committee meeting was held prior to the board meeting to finalize the budget. Bonnie went over the funds requests. A proposal from Fletcher High School for $500 for their upcoming event, Fletcher High Home Meet, with a reach of 250 people, was presented. Based on the Finance Committee, Bonnie presented a motion which was seconded by Ty to award Fletcher High School $500 was passed by the board. A proposal from Epitome of Excellence for $5,000 for their Epitome of Excellence Classic events, which has 1,100 participants was presented. Based on the recommendation of the Finance Committee, Bonnie presented a motion for $4,000 towards Epitome’s events that was seconded by Doug, then passed by the board. Bonnie mentioned that we would need a list from Angela for the dates of the events. Bonnie went over the budget for 2019. Based on the recommendation of the Finance Committee, Bonnie motioned that we accept the budget for 2019, which was seconded by Paul and then passed by the board. She also stated that the previously approved $14,130 for JU was not listed or shown in the budget. Membership – Membership is currently at 1,229 active members. Merchandise LogoXpress – Christy is the new chair of the merchandise committee as she has been working with LogoXpress to update the available JTC selection. She passed around the information regarding the current selection to be offered via online and detailed the process on how to submit orders. Various members of the board wanted to know about samples and whether we would start having merchandise at races and other events. Communications: Newsletter, Social Media – Dennis is currently in charge of the email blast and has been doing a great job. With the new newsletter process the newsletters are being received quickly. Vision & Planning – Discussed Gate River Run in terms of it’s importance to the city and our running community. Need to get picture of Tomahawk Park plaque to display on our website. NEXT MEETING – The next board meeting will be Tuesday, September 4, at 6:30 pm in the Mediterrania Restaurant. The August meeting was adjourned at 8:23 pm.